Strong growth in gas markets is a major opportunity for Shell. Our integrated gas earnings have more than trebled over the last five years, reaching $9 billion in 2012 or about 45% of Upstream earnings. This was mainly driven by several large liquefied natural gas (LNG) and gas-to-liquids (GTL) projects that came on-stream, including Pearl GTL, Pluto LNG Train 1 (Woodside), Qatargas 4 and Sakhalin-2. 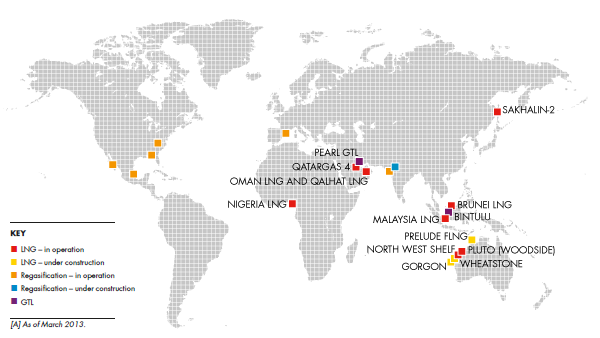 Integrated gas earnings incorporate LNG, including LNG marketing and trading, and GTL operations. In addition, the associated upstream oil and gas production activities from the Sakhalin-2, North West Shelf, Pluto LNG Train 1 (Woodside), Qatargas 4 and Pearl GTL projects are included in integrated gas earnings. Power generation and coal gasification activities are also included in integrated gas. The Prelude floating LNG (FLNG) project as well as the Greater Western Flank Phase A, Gorgon LNG Trains 1-3, North Rankin 2 and Wheatstone LNG projects are currently under construction and are expected to come on-stream within the next few years. Shell is also considering GTL and LNG options to monetise natural gas in North America. These would be projects that involve the entire natural gas value chain and so play very much to Shell’s strengths as an integrated player.